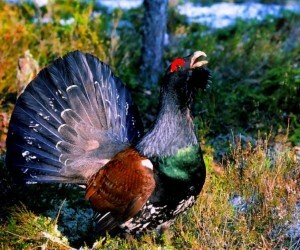 Trophy of grouse is 12000 rubles, a woodcook for free is included in the tour price. Hunting ground OROUOiR «Dubryane» was established in 2003 and is located within the boundaries of the Oleninsky district of the Tver region,300 km. from Moscow on the highway Moscow – Riga. The area of hunting ground is 20 000 ha. On the territory there are a lot of abandoned and disappeared villages and farms where apple orchards continue to bloom and bear fruits. They used to be planted and cultivated by people that along with overgrown fields provide a rich natural food base for wild animals. A complex of biotechnical measures is carried out in the hunting ground. Annually forage fields are sown, there are feeding grounds and salt licks. The hunting ground staff have a great organizing experience in all permitted kinds of hunting and individual approach to all hunting participants. Additional information: The hunting ground is situated in the track of one of the ancient settlements in the region, to the nearest village is 3 km, to the petrol station- 35 km, there is mobile communication, stove heating. Both gas stoves and Russian stove are used to cook food. One of the houses is adapted to modern conditions, there is sewage and toilet. The hunting ground is provided with electricity with the help of gasoline generators. On the highway Moscow-Riga in the direction of Riga 280 km, in the Oleninsky district turn left and drive 7 km. to p. Mirny.